Metabolomics aims to characterise changes to the complement of metabolites in a biological sample (metabolome), and this technology is gaining interest in nutrition research as it can define perturbations to metabolism induced by dietary factors. There have been a number of metabolomic studies in human and animal models based around vitamin E supplementation or deficiency that have highlighted potential areas in metabolism that vitamin E may play a role. 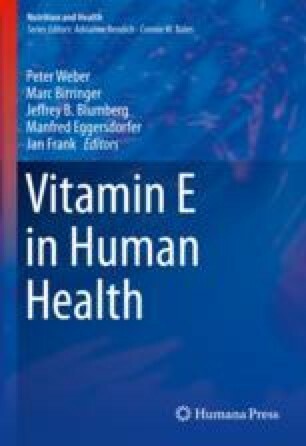 In humans, vitamin E supplementation has been shown to influence phospholipid metabolism and amino acid metabolism, and discriminatory metabolites have included several vitamin E metabolites. Proteomic studies looking at associations with vitamin E concentrations have demonstrated consistent relationships with several apoproteins. Metabolomic studies in animal models include studies on zebrafish foetal development that showed changes to antioxidant status and lipid peroxidation with vitamin E deficiency and rodent models of vitamin E deficiency that showed influences on central metabolism. Metabolomics has proven to be a useful research tool to identify novel functions of vitamin E.